← Northern Nevada Pride Coming July 26th! 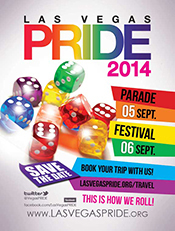 Las Vegas Pride Night Parade and Festival. A sinful women’s weekend and hotel take-over in Vegas. Interested in owning a copy of our guide(s)? Place your order here. Pride Guide® Nevada is now available in digital flipbook format. Check it out! Michael McFall, Publisher of The Pride Guides®, and The Pride Guides® Director of Advertising & Marketing, Greg Linneman, joined hundreds of LGBT business leaders across the country at the National Gay and Lesbian Chamber of Commerce’s (NGLCC) 11th Annual National Business and Leadership Conference in Las Vegas at the beginning of this month. More grand than any other PRIDE parade ever held in Las Vegas, its SNAPI’s 16th Annual PRIDE Night Parade presented by MGM Resorts International! Join us from 7 to 10pm in downtown Las Vegas for the most glamorous, glittering spectacle ever created by the gay, lesbian, bisexual, and transgender community of Southern Nevada. This year’s PRIDE Night Parade, led by our Parade Grand Marshal, features Las Vegas’ gay and straight business community, nonprofit organizations, GLBT service agencies, civic groups, and churches as well as SNAPI’s royalty. Don’t forget to come early to grab the best spot and pre-party with PRIDE (at the corner of 4th Street & Bridger Ave.) Then, when the parade ends, make sure to keep the party going at the official after parade party. The parade route begins at West Charleston Blvd. and heads north along 4th Street to Ogden Avenue. Secure your spot where the action happens early. The main stage is at Bridger Avenue just two blocks south of the Fremont Street Experience. The Clark County Amphitheater features a beautiful outdoor main stage surrounded by soft, cool grass, plus a food court and convenient drink stations. There will be more than 100 exhibitors on site. You can relax on the lawn as you are entertained by the festival’s featured performers, as well as great local talent. Watch for more expansions to the festival grounds (and overflow parking at the World Market Center with free shuttle service to the festival). We are also pleased to announce the expansion of the Family Activity Zone filled with fun activities for parents and children 12 and under. Bartenders from local GLBT bars will be will be serving water, soda, Bud/Bud Light, wine, and mixed drinks to whet your thirst. We have expanded our food court this year so you will have even more great food from which to choose. The PRIDE Festival is open to the public from noon to 10pm on Saturday, September 6th.